Diane Higgs shares a few of her treasured photographs with us while talking about her life. I grew up in a village called The Moy in Country Tyrone in Northern Ireland. I came to Oakham in England in 1977 when I was 17. I loved it straight away but I was also very homesick- it was a real culture shock. But I feel I have lived here so long now I just feel part of it. This is my home. Even when I got back to The Moy which I really love and also call 'home', I am always very happy to get this home to England. I like to come down the motorway and when I see what I call the Oakham Bonk I cheer! I am really involved in the local community. I think it really matters for people to involved in community life. We have lost a lot of it, and we really need it, and the kids need guidance. I just like helping people, and I always go for the underdog. I just enjoy watching people enjoy themselves. 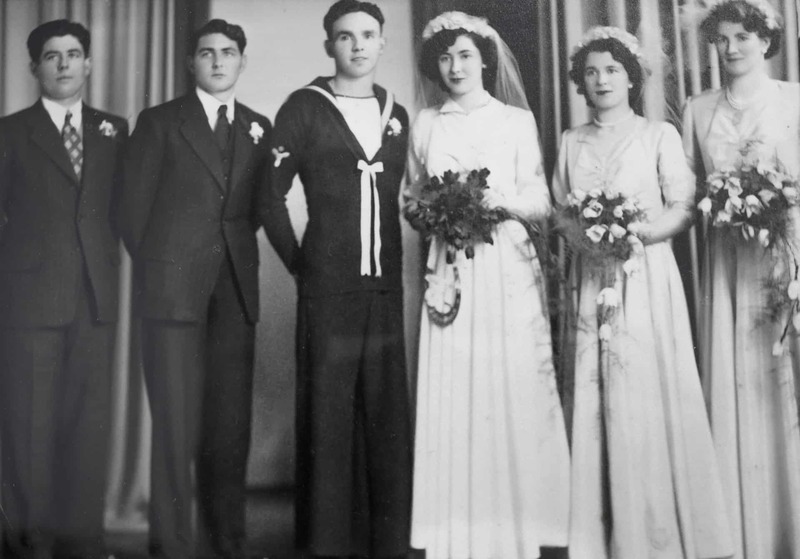 This is my mum and dad’s wedding photograph. This photo hung in our living room for many, many years and I wanted a copy. 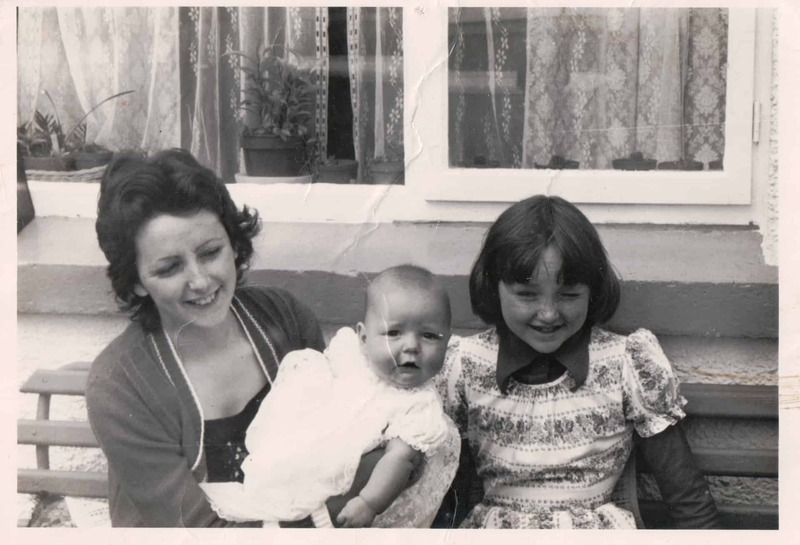 And that’s my dad Bill and my mum Mavis in the middle, and that’s my dad’s sister aunt Lily on their left who I used to spend a lot of time with. That’s my uncle Tom who never got married. My mum and dad got married in 1953 and they were together for over 50 years. My dad came from down in the ‘Bogland’ as we used to call it, where they dig the turf. He was from County Armagh, down The Birches, as they called it. He grew up in a big old house in the middle of nowhere which is now a lovely big park. My mum said he knew every tree in the park as he grew up there. My mum grew up in ‘The Moy’ we called it ‘The Moy’ and it's Country Tyrone. They had 8 children, and I am the second eldest. It was boy-girl, boy-girl, boy-girl, boy-girl. There were only 2 families in the whole of the UK like that, and they wanted us to go on television because of it, but my dad didn’t want to as he was a bit shy. My dad was in the Royal Navy and served with Lord Mountbatten, and mom actually had tea with Lady Mountbatten. My dad got a certificate for going across the equator with Lord Mountbatten. He was in the navy for 9 years. 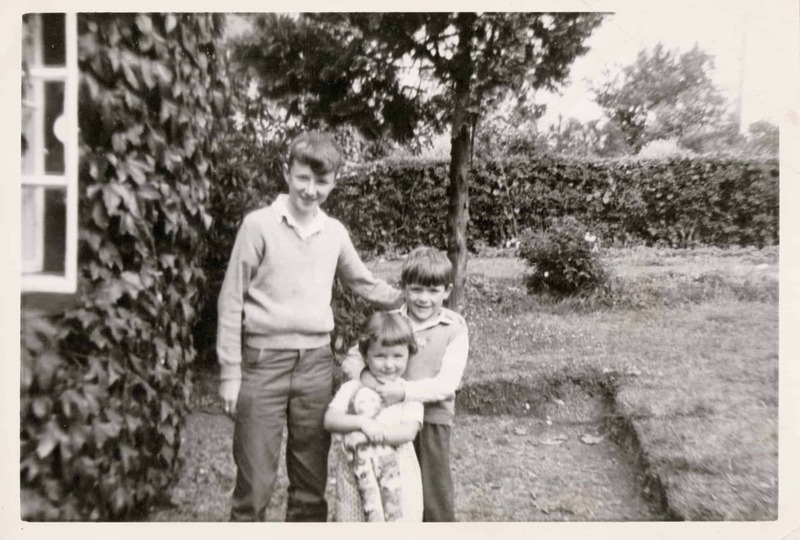 The photo on the left is me with my brother Stephen at my AuntieLlizzie's. That’s my cousin Brian on the left, he was over from Scotland, they always come over every year. And We spent hours playing around the cottage. And across the road was big orchards we used to up to place called the Orgrave. And you know, County Armagh is known for its apples, it’s beautiful, and the blossom used to be lovely. It’s about 5 miles from where I lived and used to go there all the time. I still see my brother Stephen. We were talking the other day about life back in the 60s when they built the motorways which my uncles worked on. He remembers that is f you wanted chicken for dinner you went out to the backyard where we had hen-houses for fresh eggs, well you had to catch a chicken kill it and gut it. No supermarkets back then! The photo on the right is of my aunt Lily again, she was a big part of my life, yeah she was. That’s in Greenock, in Scotland. 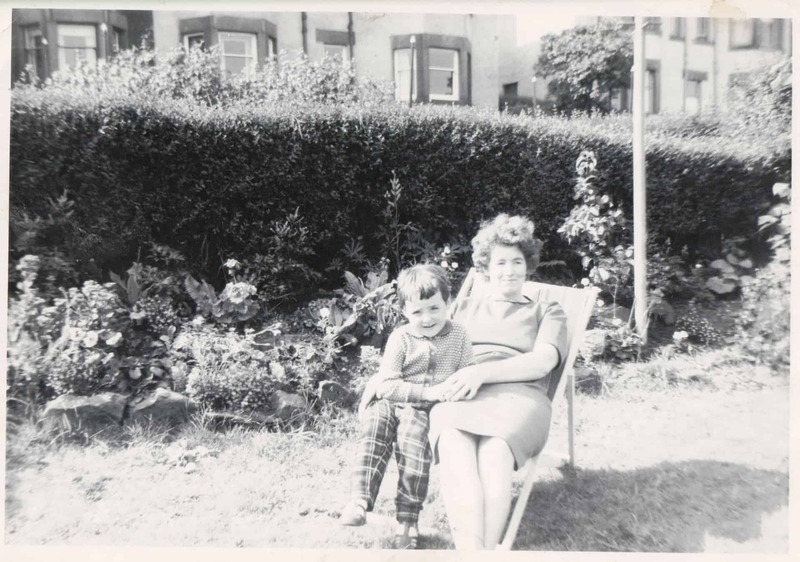 We went to Scotland because dad’s sister Susan lived there as she was married to Donald. he was an Englishman in the army, he was an RSM (Regimental Seargent Major) and she was an army nurse. 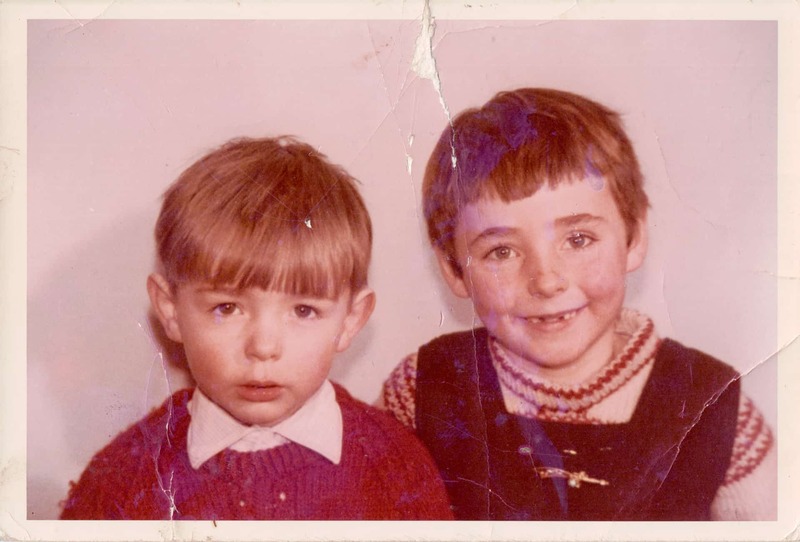 Here is me and my brother Colin, that's me with no teeth at the front. We used to go down to the hairdressers and she used to 'whack' us, which is another way of saying 'short back and sides'. That was the thing then. It looked like we had a bowl put over our heads. And of course the jumpers, everyone had these hand-knitted jumpers. I must be 6 or 7 here. 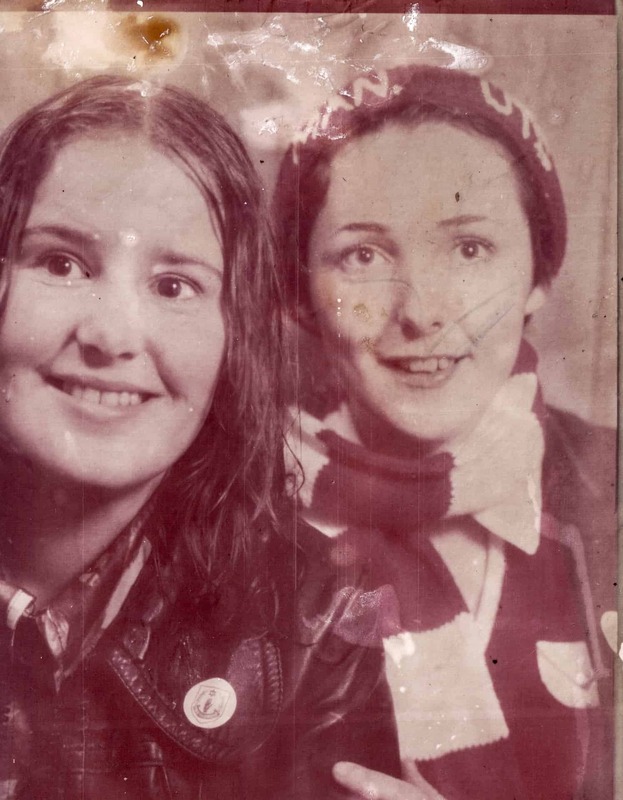 The one on the right, well I must be about 13 or 14 here, it was the early 70s, and we have our best clothes on. That's me on the right at the back. And the fellow peeping out through the window, that’s granddad Georgie McClure - he's my dad’s dad. 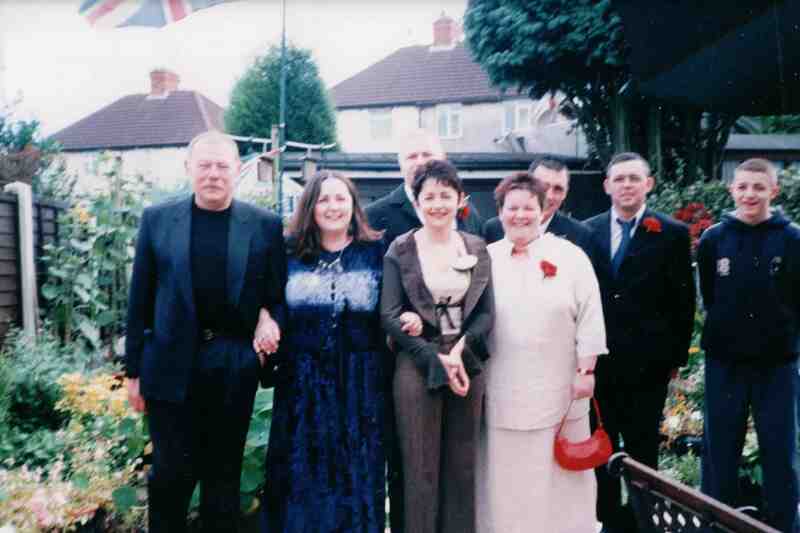 And there’s the 8 of us there with our mam and dad. And that’s Granny Creaney's house next door. Granny Creaney - well she was a great knitter, she was great at everything, crochet, knitter, baker. Because of the war, the Yanks were in the village and they used to go to grannies to wash and to shave and eat and she knitted all sorts. And I can see the crocheted blanket. That tricycle in the corner, that was one of the kids. My dad was ‘gadget man' and he'd be able to do anything. He was the only one I knew who used to go to the dump and come back with more stuff than he went with because he knew how to put things back together. Yeah, mum missed him when he passed away because she missed the ‘gadget man’. This is Janet Murphy on the left and me on the right. She was Janet Thompson back then and I was Diane McClure. I was a big Man United fan and it was the George Best days in the 70s. And we all watched England win the World Cup we all sat around the TV and watched them win. I am still in contact with Janet and that was taken in a photo-booth in Woolies in Dungannon because everyone had their photos took there back then. There was no internet or Facebook or all that lot then. 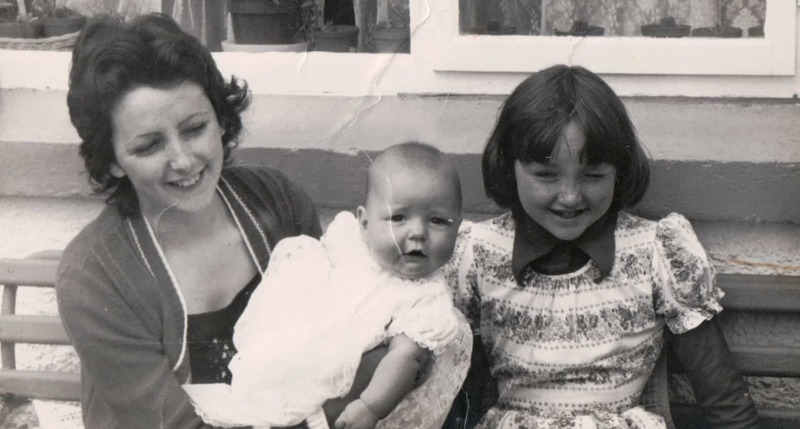 On the left that's a photo of me at 17, and I am holding Linda my daughter, and my sister Lillian. 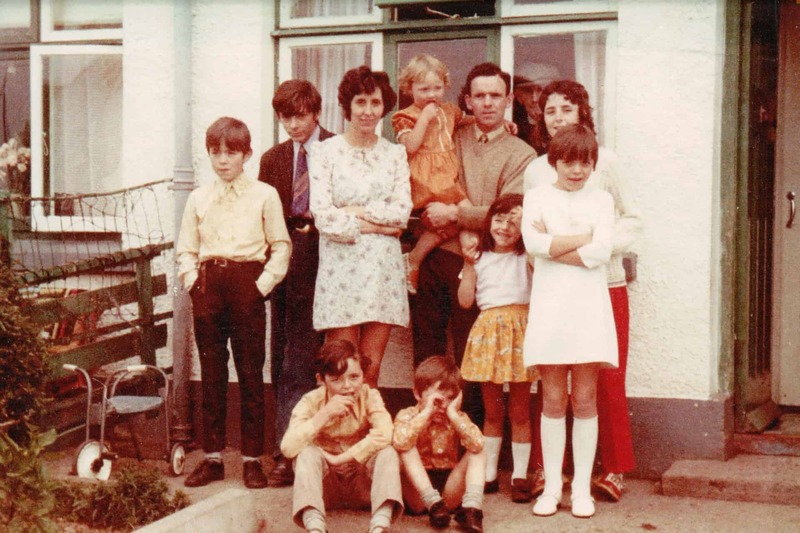 It’s just after Linda was baptised in the Moy Church - St James Church, in Moy. She was 6 months old and has her Christening robes on. I was a very young mother, you don’t realise at the time, but yeah, very young. I like this photograph. I moved to England in 1978 and I was 17, I was very young when I came here. It was a bit of a culture shock and I was a bit homesick when I first come. I went back, and we couldn’t settle and then we come back here again and then I stayed. I am still here, and I am stopping here. This is a photo of my wedding when I married Bill. Funnily enough, Bill was one of the first people I ever met when I come to England, we mixed in the same circles. I told him I was going to marry him on his 50th birthday and I did. So that’s me and Bill, my sister Janet and her husband Evans my sister-in-law Helen, my brothers, Robert, George, and my nephew Stewart. This is in my back garden, they all came over for the wedding. We were just going to go quietly but no, they said they wanted a wedding. They wanted a party. They come over every year, they like coming over. And I go back every year myself. 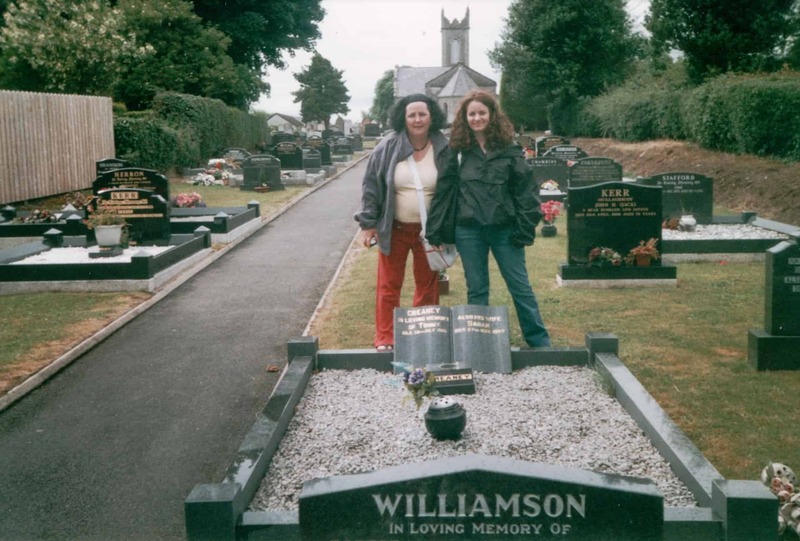 This is the back of St James’s Church in Moy, at my granny Crayny's grave, and grandad Craynee too. Grandad sadly died after England won the World Cup, he got up to go to the kitchen and dropped dead. But he did have heart trouble, he was 66. And granny lived for years and years and she used to come to England all the time and used to bring us stuff back from the Bull Ring. Back in them days, they didn’t have the stuff like they have today. And we used to love it, she used to come for a 6-week holiday and go back with a case full of toys. I love photographs, I think it’s important that you do record stuff. When the kids come they say - "let’s go through the photographs" so we get them out. It’s not the same now with Facebook and the like.